Hearts and Hands Preschool held at St. Luke's. 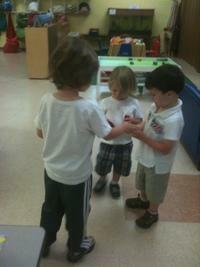 Hearts and Hands is now in their 13th year as the only full time preschool serving Calistoga. We are also the only area preschool offering substantial scholarships and about 80% of our students receive aid. Public school teachers compliment our school, saying our graduates are very well prepared for the challenges of kindergarten. WE ARE A NON-RELIGIOUS, NON-PROFIT, STATE LICENSED PRESCHOOL WITH A FULL DAY AND HALF DAY YEAR-ROUND PROGRAM 7:30AM TO 5:30PM. PREPARING CHILDREN NOT ONLY FOR KINDERGARTEN BUT FOR LIFE. COME BY AND SEE FOR YOURSELF -YOU'LL BE IMPRESSED! NOSOTROS SOMOS UNA ESCUELA LAICA SIN FINES DE LUCRO CON UN PROGRAMA TODO EL AÃ‘O 7:30A.M. TO 5:30P.M. Y UN PLAN DE ESTUDIOS DE ALTA CATEGORIA, MAESTROS CON EXPERIENCIA Y UN PROGRAMA DE VERANO.
. PREPARANDO A LOS NIÃ‘OS NO SOLO PARA EL KINDER PERO PARA LA VIDA TAMBIEN. VEN A CONOCERNOS Y VEA POR SI MISMO - QUEDARÃ� IMPRESIONADO!